Of all popular music biopics that could possibly be, none should be more epic than the story of Freddie Mercury. Bohemian Rhapsody was almost that movie. 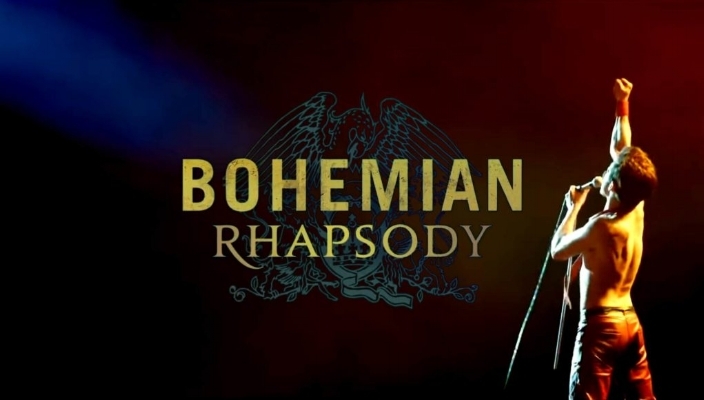 The troubled production history on this film about the turbulent life and career of the frontman of Queen has given the finished product a certain degree of notoriety and infamy. Initially conceived with Sacha Baron Cohen in the lead role, the alleged dissatisfaction of the former band members led to it changing hands in director, writer, and star a few times. Once they approved a script by Anthony McCarten, Rami Malek was cast and the controversial Bryan Singer hired as director. And then Singer was fired midway through production for bad behaviour to be replaced by Sunshine on Leith and Eddie the Eagle director Dexter Fletcher. But DGA rules prevented Fletcher from getting the credit he deserves. With all this behind the scenes trouble you’d expect some of that to be reflected on screen. And Bohemian Rhapsody is surely not as good as it could have been, but it’s fortunate to be saved by the sublime performance that anchors it. 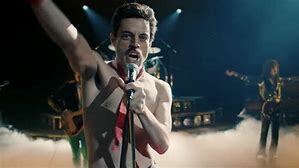 The movie chronicles Farrokh Bulsara’s (Malek) beginnings as a young British Parsi baggage handler, meeting Brian May (Gwilym Lee) and Roger Taylor (Ben Hardy) at a nightclub, whom he impresses with his extremely versatile singing voice; and then with John Deacon (Joe Mazello) forming the band Queen. 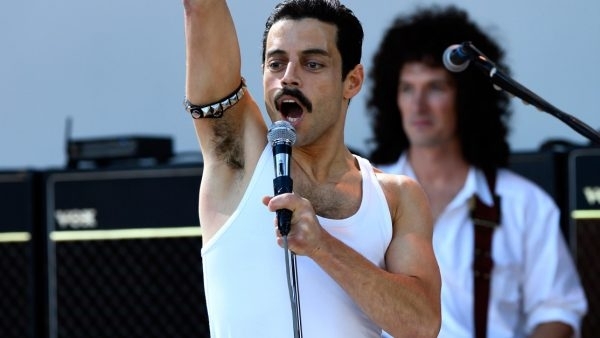 He changes his legal name to Freddie Mercury and the band becomes a hit as his relationship with his girlfriend Mary Austin (Lucy Boynton) also develops. The film depicts his struggle with his sexuality, his conflicts within the band and his excesses, and eventually his contraction of and coping with AIDS. The first act is almost frantic in its pacing, speeding through a lot of the early history of Mercury and the band and his relationship with Mary. We get almost no sense of who Farrokh Bulsara was before Queen, and their rise to fame comes across as almost an overnight success. It only starts to settle into a groove once it gets to the creation of A Night at the Opera and “Bohemian Rhapsody” specifically. But the writing remains sub-par and hackneyed in a number of places. The fear that the movie would be toned down to some degree in terms of its content isn’t entirely alleviated either. It does show some of the bad decisions Mercury made, the brief break-up of the band, but mostly just hints at the libidinous, hedonistic escapades that characterized his career. It doesn’t present as nuanced a portrait of his life as it should, ending six years before his death so as not to have to touch on his tragic last days. But the greatest saving grace of Bohemian Rhapsody is Rami Malek’s performance. It takes a little while to get used to his obviously fake teeth, but Malek completely throws himself into the role and astonishingly recreates the personality, eccentricities, and iconic showmanship of Freddie Mercury. His stage presence especially is a joy to watch, as he doesn’t feel to just be imitating Mercury’s grandiose style, but genuinely channelling it, to the degree it’s almost as mesmerizing as watching Mercury himself. It’s a remarkable feat for such a quiet actor. Lee, Mazello, and Hardy are good too (Lee being a dead ringer for Brian May), though the age gap between Hardy and Boynton in particular to the rest of the cast is pretty noticeable. Allen Leech is commendably toxic as Mercury’s conniving personal manager. The cast also includes Ace Bhatti and Meneka Das as his parents, Aidan Gillen and Tom Hollander, and a somewhat out of place Mike Myers as an executive just there for a Wayne’s World joke. One of the biggest draws for the movie obviously is the music, and obviously it’s great. The singers do an excellent job with the classic songs and the performance sequences, though not as tremendous as A Star is Born, are very nicely shot and convey the atmosphere of being at a concert, both on stage and in the audience. However the movie does use the songs as a crutch too. The film plays like a soundtrack of Queen’s Greatest Hits, and you can feel it at times just waiting to get to the next song. The climax at their historic 1985 Live Aid performance is stellar, with on-point recreations of the “Note Heard Round the World” and the various choreography. But re-enacting Queen’s entire twenty minute set was going a bit far. The actual performance can be watched in its entirety on youtube and as much as the attention to detail here is impressive, it can’t beat the real thing. It can’t be said that Bohemian Rhapsody is not a heartfelt tribute to Freddie Mercury and Queen. But likewise it can’t be denied it doesn’t fall short of Mercury’s larger-than-life legacy in its sadly generic elements. Rami Malek’s performance is what makes it worth seeing though, and the music isn’t a bad selling point either. Though it’s not a kind of magic by any means.